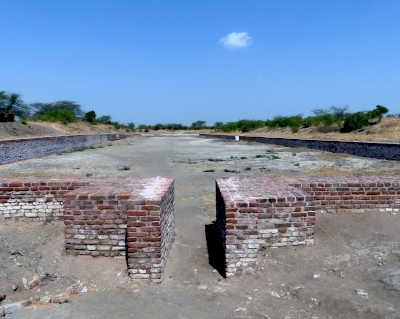 Archaeological remains of a Harappa Port-Town, Lothal is part of the Tentative list of India in order to qualify for inclusion in the World Heritage List. After Partition at Independence in 1947, India found that both of the, then known, great sites of the Indus Valley Civilisation (IVC – I am using the phrase to cover all of the periods across which the relevant sites developed/declined), whose very existence had only been established as recently as 1924 i.e. Moenjodaro and Harappa, had finished up in Pakistan! There is much academic (and “nationalistic”) debate about the contribution of the IVC to later “Indian culture” but a combination of myth and reality means that India sees it much as Egypt and Greece regard their respective “founding civilizations” - except that India had been “cut off” from its “foundation” sites! To rectify this, the Archaeological Survey of India (ASI) set about trying to discover further IVC sites within its new boundaries. Efforts were concentrated in the area of Gujarat, south east of the Indus valley. In 1954, a significant success was recorded with the discovery of a “city” which could be shown to have “belonged” to the IVC. This became known as “Lothal” ( = “Mound of the Dead” after the burials found there. Was it merely a "coincidence" that "Moenjodaro" means the same???). Subsequently, a number of other sites associated with the IVC were discovered within India - the most important being Dholavira in 1967 (situated some 350kms NW of Lothal very close to the Pakistan frontier). India placed both these sites on its T List in 2014 - separately!! Meanwhile Pakistan had actually gained WHS inscription for Moenjodaro in 2004 and had tried with a combined extension of 3 further IVC sites in 2008 (Harappa, Mehrgarh and Rehman Dheri). This failed at the first hurdle for being “Incomplete” and the 3 sites remain (separately!!) on Pakistan’s T List with no known further activity. So - we have 2 countries which cannot/will not work together, sharing a series of archaeological sites belonging to the same ancient “civilization”, each apparently intent on progressing them independently for possible WHS inscription! We had already visited Moenjodaro and Harappa in Pakistan so, when we visited Gujarat in Feb 2019, decided to take in Lothal in order to assess whether it would add anything significant to the list, and, if so, how it might be progressed. The remains on show at Lothal are significantly smaller than both Moenjodaro and Harappa and, from what I have read, Dholavira as well – indeed “city” is not really the correct description of what it was. However, there were the same bricks, wells, drainage channels etc as we had seen at the Pakistani sites and the same foundations labelled as “Warehouses” and “Upper class Housing” etc. Where Lothal’s great (potentially!) unique “claim to fame” lies is identified in the grand title it has been given - “Archaeological remains of a Harappa Port-Town, Lothal”. It was at its peak around 2400-1600BC and, among the finds made there, have been “Persian Gulf” seals from Dilmun/Bahrain. It is situated where a navigable river once (it has since changed its course) provided access to the Arabian Sea and there seems little doubt that some long distance and overseas trade did take place there. But that is not all! Among the excavated remains is a large rectangular “basin with vertical wall, inlet and outlet channels” which has been identified as a “tidal dockyard” (UNESCO desc). The uncertainty regarding the real purpose of the "Dock" does not of course invalidate the importance of the many smaller finds and remains at Lothal. The site has a nice little museum, albeit rather run down and with a lot of “blanked out” cabinets, while others display "excavated" items – though a fair number are probably copies (it also had "that" painting again!). However it told the site’s tale quite well and did demonstrate its undoubted significance as a manufacturing site for stone and shell beads which were then widely traded (the "bead factory" is on show in the site). Non-flash photos were now allowed. We spoke to the on-site Archaeologist and asked him about any possible World Heritage inscription. He clearly knew nothing on the subject. I questioned whether there might be any benefit in a joint nomination of Lothal and Dholavira, but he wasn’t aware that it was even possible to have 2 or more locations within 1 WHS. However, Lothal HAS been figuring in the “Nationalist” agenda of Prime Minister Modi and his BJP (Gujarat is his “home state”). This 2017 article shows how he has recently “used” Lothal to promote it. Note the sentence - “planners of the early city were well-versed with Vaastu techniques and had planned their city on its basis”. “Vaastu” is the “traditional Hindu system of architecture…. that describe principles of design, layout, measurements, ground preparation, space arrangement, and spatial geometry” – but was the IVC really “Hindu” or “Vedic” in any meaningful way? See this “pro-Vedic” article. (the fact that the "Vedic creationist" author doesn't accept Darwinian evolution might impact your assessment of it, but, in any case, it demonstrates the sort of "philosophical baggage" which is being loaded on Lothal!). Regarding the Modi "announcement", this video provides an amazing foresight of what “might” yet exist, with Lothal becoming the focal point for a nearby theme park extolling Indian maritime history. Such a park may seem a “big leap” for the India of the past but could be easily justifiable for a site only c90kms from the city of Ahmedabad with its growing population of over 5 million and increasing numbers of middle class Indians wanting nearby locations for family trips! India is changing fast and could yet change as much as China has. Lothal may currently be situated “deep” in rural India - but it won’t be so for long. Despite not visiting it, I have tried to compare Dholavira with Lothal in order to decide which might have a better case for nomination in Indian eyes. Dholavira was founded earlier and both lasted through to a “post-Harappan” era. Both have significant “water management” aspects. This (Indian!) article from 2017 claims that Dholavira is “crucial to India’s prehistory, as prominent a site of the Indus Valley Civilisation as Mohenjodaro or Harappa” and identifies a number of significant features. But can it really “match” Lothal’s “Dock” aspect? This article from 2009 indicates that the ASI was trying to acquire land to support Dholavira’s nomination but had run into problems. Both are run by the ASI and situated in Gujarat and therefore have the same state government deciding if either is to be proposed for National nomination. In summary, both sites have their importance, but neither would seem to offer a “perfect” case! There seems no evidence that they are being progressed jointly and both seem to have management issues (as is so often the case with Indian sites!). The Lothal area seems to be about to receive much investment – but whether the envisaged “theme park” would actually benefit its WHS case is another matter. In the mean time regarding Lothal - if you are not “into” the IVC it is certainly “missable”. But if you are in Ahmedabad with spare time or passing nearby on a tour of Gujarat (if you have visited the Jain mountain of Palitana for instance) then you might as well take it in! It is possible to visit Lothal on a day trip from Ahmedabad using public transportation but it is really a very tiring trip, you have to take at least two buses (to Bodgara and then the local bus to Anrej) to and walk the remaining 4 kilometers under the sun. A taxi for the whole trip (return) will cost you around 25 euros. The entrance fee is only 5 rupiees. Take plenty of water - no shops around. In general - the trip is worth and rewarding if you keep in mind that the ruins used to be the only port serving the whole Indus civilization. And the seals and perforated jars - are something really stunning.